Since the DeYoung Brothers first founded the The Daily Dramatic Chronicle in 1865, the home of San Francisco’s pioneering newspaper has been an incubator for ideas and innovation. 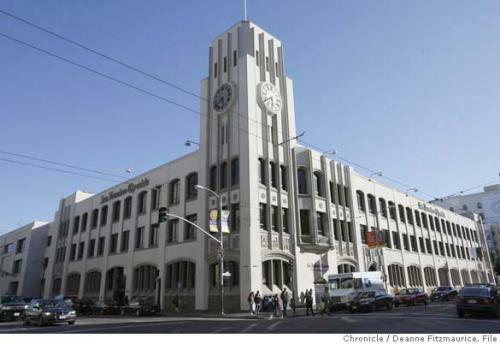 Within a decade of its founding, the San Francisco Chronicle had the largest circulation of any newspaper west of the Mississippi River. The company has moved twice since then, and its headquarters buildings have always represented changing ideas about design and planning in the city. Today that's more true than ever: the Chronicle’s current home at 901 Mission Street is part of the 5M project, a redevelopment project that fosters innovation by providing space, funding and counseling to startup companies. This Tuesday, June 21, SPUR will hold a forum on artisan manufacturing at TechShop, a member-based workshop located at 926 Howard Street and part of the 5M block. Before we visit this latest incarnation, let's look back at the history and transformation of the Chron's many headquarters. 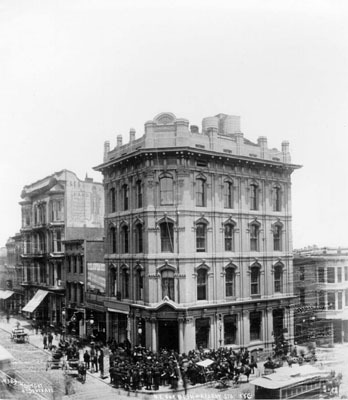 The first Chronicle office was at the corner of Bush and Kearny Streets, shown below in 1880. Once the newspaper gained momentum, the DeYoung Brothers commissioned legendary skyscraper architects Burnham and Root of Chicago to design the original Chronicle Building (also known as the “Old” Chronicle Building or the DeYoung Building). Completed in 1889, it was located at 690 Market Street, at the corner of Third and Kearny Streets. After the 1906 earthquake and fire, Burnham’s local architect, Willis Polk, rebuilt the building, which was restored in 2007 and is now listed as a local historic landmark. The iconic design of the original headquarters building, the first skyscraper in San Francisco and the first steel frame building in the west, represented the city's turn-of-the-century prosperity and its earnest rebuilding effort. 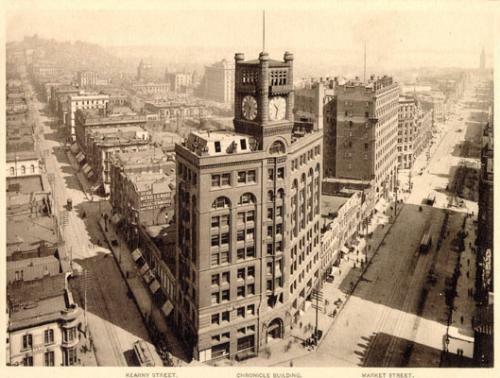 In 1924, as the newspaper continued to grow, the Chron's owners commissioned a new headquarters and newspaper publishing plant at 901 Mission Street, at the corner of Fifth and Mission. Designed by Charles Peter Weeks & William Peyton Day, the building was constructed in the Gothic Revival style, said to reflect the scholastic and romantic nature of the newspaper business. This building was re-clad with stucco and stripped of much of its Gothic Revival detailing in 1968. The 901 Mission Street building has served as the home base of the Chronicle for eighty-seven years and is currently undergoing a transformation of a different kind. Today, the Chronicle’s home is part of the enterprising 5M project. The current tenants of the project include TechShop (a membership-based workshop), Intersection for the Arts (an alternative nonprofit art space), the Hub Bay Area (an international social entrepreneurs' collective), and Square (a mobile payment firm). In addition to our forum at TechShop this week, we'll also hear the story behind the visioning and creation of this creative cluster at our Incubators and creative communities forum on August 17.